The pace of retail inflation quickened in personal computers, biscuits, laptops, cinema tickets and cigarettes in July, when the goods and service tax (GST) was introduced, compared with June and May. Gold prices continued to fall, in fact at a higher rate in July against June and May. Internet expenses also saw a higher rate of price increase at 1.83 per cent in July compared with 1.39 per cent in June and 1.22 per cent in May, revealed official figures. Data on the basis of the Consumer Price Index (CPI) for both May and June was taken for this analysis as the June numbers would not have been ideal for comparison. Companies were de-stocking their goods in June because GST was to be introduced from July. This argument could be substantiated from the inflation data on beverages such as those of cocoa and chocolate. While inflation in these was higher at 2.98 per cent in July, compared with 2.91 per cent in June. It was lower than 3.16 per cent in May. Also, inflation in mobile handsets was 1.95 per cent in June as well as July, but it was lower at 1.56 per cent in May. Tax is one of the factors that explains inflation but is not the only reason for the price rise. For instance, tax on gold was a bit higher in the post-GST regime compared with the earlier system. But gold prices fell 7.44 per cent in July, higher than 5.36 per cent in June and 4.98 per cent in May. 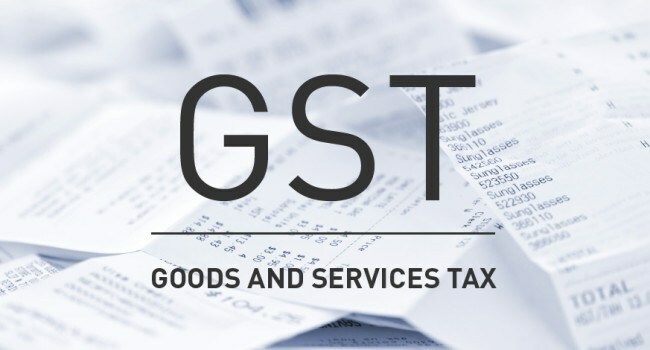 Sumit Dahiya of Taxmann said the jewellery industry saw higher impact of GST than other goods as the rate of indirect tax on gold has increased by 50 per cent to 3 per cent from the earlier 2 per cent. But then, why are gold prices falling? It has to do with many other things. For example, the season of saavan, which started on July 16, is considered inauspicious for buying gold in many parts of the country, said M S Mani of Deloitte. Refrigerators, washing machines, air conditioners and air coolers saw the same tax increase under the new taxation system. But inflation in air conditioners and air coolers came down in July, compared to June and May, while refrigerators and washing machines saw higher price rises in this period. This may be due to the onset of monsoon, which led to less demand for at least air coolers, if not for air conditioners, an analyst explained. Mani said the attempt was to ensure GST rates for products were similar to the rates under the earlier system. But due to rate slabs, the effective rates on some products have increased while those on some products have come down. He said there were significant rate differences between the states in the past, hence a comparison at the product level was difficult. For instance, he said, entertainment tax rates on movie tickets varied between 10 per cent and 45 per cent in the past. Hence a GST of 28 per cent on movie tickets would have reduced the rate in some states but increased prices in others. Aditi Nayar of ICRA said after the announcement of the GST, there has been a mixed trend in revision of prices. For instance, she said, several services were now being taxed at 18 per cent or 28 per cent, higher than the earlier 15 per cent (inclusive of various cesses). These have been passed on to consumers in cases such as mobile phone bills, etc. She said there was anecdotal evidence that final prices have been kept unchanged in some discretionary consumption sectors, with the higher tax liability being absorbed by the producers. This is likely to affect margins in Q2 FY18, she said. 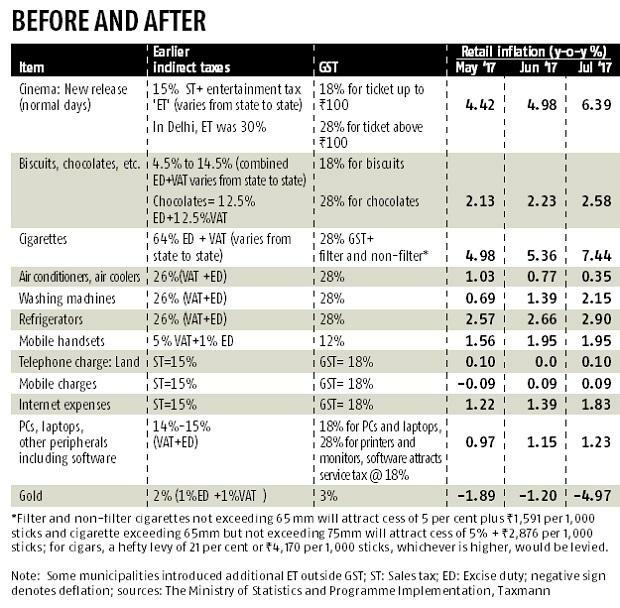 The GST Council had raised cesses on cigarettes after it was found that tax incidence under the regime was less. Also, companies were yet to figure out their input tax credit in July and benefits of area-based exemptions. For those who want to claim credit, the date for filing preliminary returns has been extended to August 28 from August 20. The sunset clause for area-based exemptions has also been extended till 2027 but companies have to pay tax and then claim reimbursement.